Preheat oven to 350 degrees. Wash potatoes and poke several times with a fork. Salt the outside of the potatoes if you plan on eating the skins. Place in a microwave and oven safe dish and microwave on full power 7 minutes. Take dish from microwave and place in oven and cook 15 -30 minutes as you prep the rest of your dinner. If you have something else in the oven that needs it to be a little lower or higher temperature, no worries – the potatoes will be fine at the alternate temperature. If you are using larger sized potatoes, increase the microwave time a few minutes. 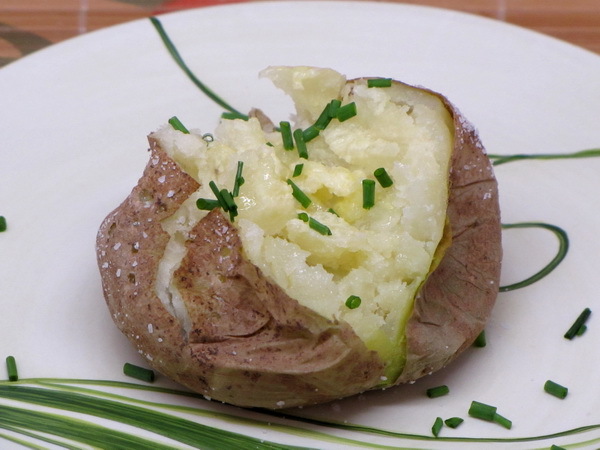 Split potatoes and prepare with ICBINB spray and sprinkle with salt and chives. Another great low cal topping for potatoes is salsa – – for just 40 calories you can load a 1/2 cup on top of your potato !